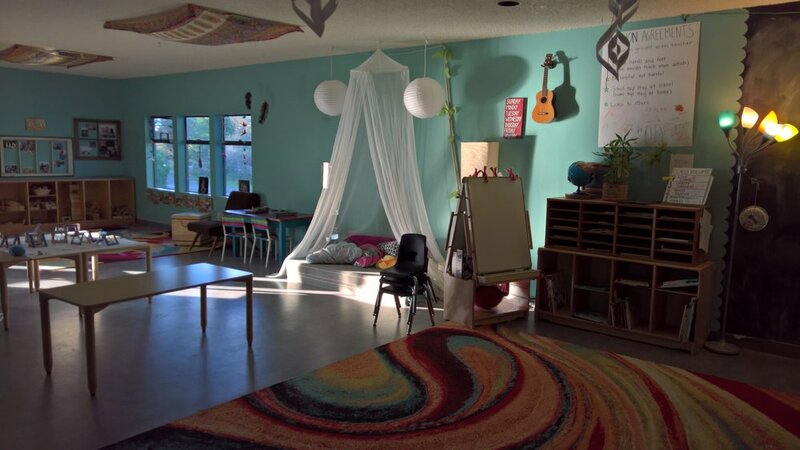 Founded in 2005, The Community School of West Seattle (CSWS) is a creative, exploratory and play-based preschool that each year serves 100 children between 3-5 years old, and their families. At the heart of our philosophy is the idea that play is the work of children and that play is how children learn. We believe that if a child’s first experience at school is joyful and relevant, if their curiosity is validated and honored, then learning will become a life-long pursuit. Through authentic, emergent, project and play-based learning the school strives to develop each student socially, emotionally, intellectually, and physically, so that every child will gain a sense of self and life-long confidence. We believe that learning is happening all the time and that this may look very different from child to child. We respect the way each child learns and support each child’s curiosity and own learning path. An exploration of the garden on a rainy day may be about science for one student, “The dirt is now mud because of the water!” About math for another, “There are 3 puddles for me to jump in!” About colors to yet another, “Look how green the trees look against the grey sky!” All of this is valid, all of it is learning, all of it should be encouraged and celebrated. Creating a community (and a world) where all people feel welcome and valued for who they are is very important to us. We are committed to anti-bias education and actively look for opportunities to work with our students to cultivate a deep respect for differences in each other, our families, and our world. We stand for racial equity and social justice and believe it is our duty to work towards a more just society. We are developing this commitment through planning, discussions, reflection, and training for our staff and families. Families are an integral part of the school. We provide volunteer opportunities, events, and educational offerings to families as a way to strengthen our community and support the school as a whole. CSWS was selected as a QRIS Early Adopter in 2008 and has continued to meet the high standards of the Early Achiever program. Specifically demonstrating best practices in Interaction & Environment, Curriculum & Staff Support and Family Engagement & Partnership. The Community School of West Seattle is governed by a volunteer Board of Directors. Learn more in-depth about our education philosophy and curriculum.